Although international trains are slowly being replaced by a network of intercity bus routes, train travel still can be a convenient and comfortable way to get to Croatia. Anyone transporting bikes, pets, small children or cumbersome baggage may well prefer trains to buses or flights. Nearly all international trains to Croatia end in Zagreb's main train station, Glavni Kolodvor, which is right in the centre of town. There you can get a train connection to Zadar, Rijeka, or Split. The Zagreb bus station is also an easy tram ride away. There are no longer any trains between Italy and Croatia. The best available route is to take a train to Venice or Trieste to Ljubljana, Slovenia. Stay overnight and catch a morning train to Zagreb. There are five daily trains which take about 2 1/2 hours. There are two direct trains daily that take about 3 hours. 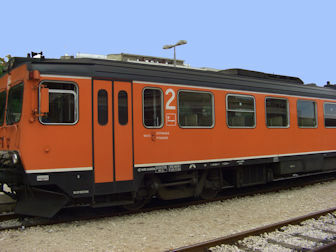 There are three daily trains to Pula that take about four hours with a stop in Buzet. See the Ljubljana Train Station for schedules and booking. There's one non-stop train daily from Vienna to Zagreb that takes about 6 1/2 hours and five other trains with one to four stops. Check schedules and book with Omni. Buying your tickets to Croatia in advance can save you a huge amount of holiday hassles. Of course you could always go to the train station in whatever city you're in, wait on line and deal with a clerk who may or may not speak English. But do you really want to spend your vacation in train stations? I don't! I would much rather do other things which is why I find booking train tickets online a wonderful convenience. National railroad lines usually offer online booking but seem to have trouble handling some international routes. That's why I highly recommend experienced online booking agencies such as Omni which also handles international bus routes. If Omni doesn't have your train, try RailEurope. It's unlikely that you'll be train travelling enough within Croatia to justify a Croatia Rail Pass (see getting around Croatia by train) but a rail pass could be a good idea if you'll be combining Croatia with other countries. Read more.